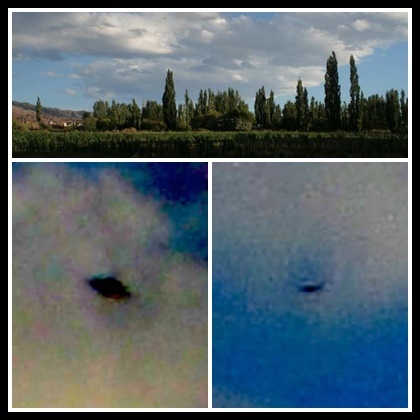 Inexplicata-The Journal of Hispanic Ufology: Argentina: UFOs Over Barreal? Argentina: UFOs (or BLURFOs) Over Barreal? A man took photographs along the Route 149 near San Martín street without seeing a single thing. He was startled, however, upon viewing the images. SAN JUAN - Hector Eduardo Sawiak is a resident of San Juan and a fan of extraterrestrial phenomena, as well as a member of ICOU (Investigadores de Campo Unidos - United Field Researchers), a federal network that extends throughout the country. A few days ago, while visiting Barreal, he stopped along Route 149 near San Martín street to take a photo of the landscape. He noticed nothing unusual at first. But upon downloading photos to his computer, he found something striking. "Normally, they move at speeds imperceptible to the human eye," he told DIARIO DE CUYO, regarding the UFO phenomenon. "I take my humble camera everywhere I go, sometimes in an effort to photograph something, at others just to shoot the landscape," he added. Guatemala: A UFO Crash at Mataquescuintla?